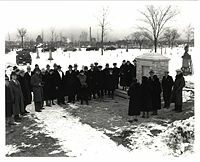 About 10 years ago the caretaker of the Soldiers’ and Pioneers’ Memorial Cemetery on Lake Street showed Susan Hunter Weir a unique gravestone. John Effert’s gravestone was marked with the symbol of the labor movement, instead of the normal religious symbols. Intrigued by the story, Ms. Weir, already an active member of the nearby Phillips neighborhood, began to dig further into his story. Her curiosity sparked, Ms. Weir was, in her own words, “off to the races.” During the time between then and now she has become an expert not only on the Cemetery but those who have been laid to rest there. The cemetery was formed in the 1850’s on the land of the Laymans, early pioneers in Minnesota. Their cemetery was unique because it was not segregated, probably due to their membership in the Baptist Church. Eventually more than 20,000 people of all races and classes would come to be buried within the cemetery’s boundaries, although just 1800 of them were given markers. Many have deteriorated, but we are lucky that many of them have been saved. In the early 20th Century the Cemetery faced hard times, and was nearly lost to development. Thanks in large part to a letter writing campaign by relatives of the soldiers interred in the cemetery it was preserved, and eventually added to the National Register of Historical Places in 2002. Ms. Weir has taken the lead in preserving the stories from the Cemetery. She has published numerous articles chronicling those who are buried in the cemetery in the local publication The Alley. Her goal is to make the cemetery accessible and interesting to the people from the area; to engage the local community. Although the groups have changed over time, “the issues are the same,” she said. The Cemetery Society also publishes a quarterly newsletter and hold numerous events such as “Family Day” to bring people into the cemetery and spark conversations about the stories within its walls. Join us now as Ms. Weir leads us through some of the people laid to rest in the cemetery through her writings from The Alley. Since the cemetery was desegregated from its inception, there are numerous African American graves within its walls. William Goodridge was born a slave in 1806. After being given his freedom at the age of 16 he embarked on a successful career in business in the York, Pennsylvania area. While living there he also ran the Underground Railroad between York and Philadelphia. Unfortunately for Mr. Goodridge suspicion grew around his activities, and he was forced to leave Pennsylvania to keep from getting into trouble. He made his way to Minneapolis in 1865 to live with his daughter, continuing the fight for freedom before dying in 1873. His grandson, L’Ouverture Grey was the first African American born in St. Anthony. His grave became lost once his descendants left the state, but was rediscovered in 2003 by Friends of the Cemetery. Layman's Cemetery contains many people with Scandinavian roots that remain as evidence of their contribution to the area. Like many Lake Street residence in the early 20th Century, Otto Wisen arrived in this country from Scandinavia. After passing through Ellis Island in 1900 he went to live with his brother in Lake City, Minnesota for a few years before moving to Minneapolis. He found a job as a gardener for grain merchant Franklin Peavy. Mr. Wisen lived at 1209 Second Avenue South, where he was found dead in his room on October 13, 1915. He had forgotten to close the gas jet to the lamp in his room, filling it with gas, and had died an accidental death. Like so many others he is buried in an unmarked grave. Within the boundaries of the cemetery lie some of Minneapolis’ most important pioneers. The Prescotts were one of the earliest families of Minneapolis. Philander Prescott was in the area as early as 1819 providing goods to the soldiers of Fort Snelling. Four years later he approached Cloud Man to ask permission to marry his daughter, Spirit of the Moon. With the elder’s permission, the two were wed, with Ms. Prescott taking the Christian name Mary. Their marriage lasted over 40 years, until Mr. Prescott was killed during the 1862 Dakota Conflict, and his body was brought back to Minneapolis for burial. Mary followed him in death five years later and became the only person known to be full blooded Native American to be buried in the Cemetery. True to its name, the cemetery contains the graves of many soldiers, including 160 from the Civil War and Indian Wars. William Frederick Holtz was born in Prussia, arriving in the United States in 1848. He moved to Plymouth Township, Minnesota in 1854. When the Civil War broke out in 1861, Mr. Holtz enlisted in the Fourth Regiment of Minnesota Volunteers and became one of the 400,000 immigrants to serve for the Union. After serving at the brutal siege of Corinth, Mississippi, he was given a disability discharge, returning to Minnesota in 1862. William Frederick Holtz died in 1869. Asa Clark Brown served in the oft overlooked War of 1812 before moving to Minnesota before 1860. He lived until 1866, long enough to see three sons and seven grandsons return safely from service in the Civil War. Long before Lake Street became known for vice, there were examples of what was to come. Della Stokes was described as a “woman of the underworld” by the Star Tribune in her obituary. She was a con artist and thief, and possibly a prostitute. Her lifestyle led to her death on October 8, 1915, when she was murdered by someone whose wallet she had stolen. Ms. Stokes was made an example of by the downtown business association that was trying to clean up the image of Minneapolis, and were worried about the vice that was growing around the train depots south of town (the entranceway to the city) and thus her death and lifestyle were given much attention in the local papers. On May 2, 1878 the Washburn A Mill, situated at St. Anthony Falls, exploded, completely destroying the building and several around it. Rumor had it that windows broke as far away as St. Paul. Eighteen mill workers died in the tragedy, and two of them were laid to rest in the Soldiers’ and Pioneers’ Cemetery. Both Ole Shei and August Smith were Norwegian immigrants who were supporting families by working in the mills when their lives were cut short. They were interred in the cemetery 10 days after the explosion. When I was about ten years old in 1949 my friend Geraldine and I decided to take a shortcut to her aunt's house on 21st Avenue and Lake Street. We entered the Layman Cemetery at the Cedar Avenue entrance and walked throught the cemetery to the opposite side. When we got there that gate had been locked. We headed back to the Cedar Avene side only to find that gate had also been locked. We were now locked inside the cemetery! We tried to climb up the black iron fence, but the spikes on top were very difficult to climb over in our skirts. (No jeans for girls in those days.) Finally I, with my long legs, managed to get on the other side and help Geraldine somehow get over, also. What a relief! We thought for a time that we might have to spend the night in a cemetery. We never took that shortcut again. This page was last modified on January 14, 2009, at 16:46. This page has been accessed 35,953 times.